Durango, Colorado features a large selection of amazing rental villas, condo rentals and vacation homes. Durango is the type of town that individuals dream about with its natural beauty and the residents are extremely friendly and down to earth. The town only has a population of about 15,000 people, but there are plenty of things to do, including recreational activities. Durango, Colorado features a geography area that provides a great amount of activities and attractions to enjoy, for both tourists and residents. Durango is nationally known for the Durango and Silverton Railroads, Mesa Verde National Park, along with some of the best mountain biking in the country. However, if you ask the residents of Durango they will tell you there is so much more that the town offers for tourists. If you are there to enjoy some relaxation/leisure, you will have the opportunity for boating or fishing at the Vallecito Lake, gorgeous scenic drives, world class fly fishing on the Animas River, along with going down the Animas River Path through Durango. The downtown area of Durango features state of the art cafes, art galleries, museums, shopping and fine dining. If you are taking your family to Durango, you will have plenty of the activities the whole family can enjoy! There is the Durango Recreation Center, Children's Museum, friendly hiking trails to the hot springs, alpine slide, rock wall, mountain biking, along with miniature golf. Other activities guest of Durango, CO can enjoy include: a ski resort 25 miles north of Durango, two golf courses, a casino, camping, kayaking or rafting, hunting, horseback riding, along with live entertainment. There are also some amazing archaeological sites that are saturated throughout Durango, Colorado. In the summer months, the weather is extremely pleasant featuring daytime highs in the 70-80's with lows in the 50's. So, if you are looking to get away from the hot humid summer weather, Durango is a great place to take a summer vacation. 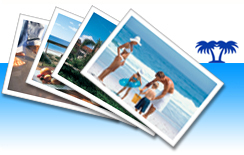 You can book your next vacation direct by owner online at ivacationonline.com using ourvacation rental management software.Your next dream vacation can be booked in a matter of minutes at a great value, along with having the luxury and amenities of your own home away from home.